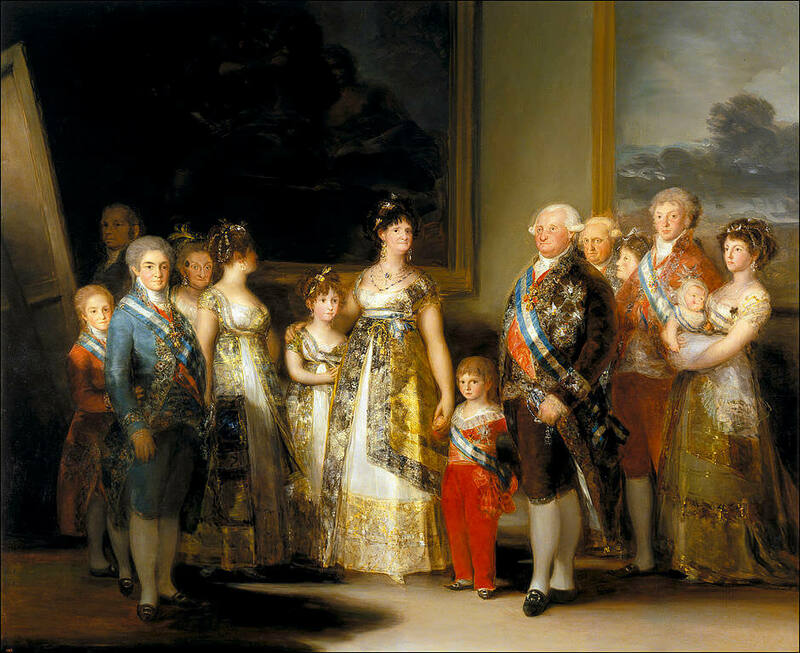 "The King says that as soon as Goya is done with your wife's portrait he is to come here and do one of all of us together," wrote Queen Maria Luisa in a letter dated 22 April 1800 and sent from Aranjuez to Manuel Godoy, whose wife, the future countess of Chinchon, Goya was painting at the time.1 And indeed, the newly appointed first painter to the king received a commission to immortalize the king's family on an enormous canvas. Toward the end of June he therefore repaired to the royal residence of Aranjuez to carry out ten portraits of family members. Back in his Madrid studio Goya assembled the heads as though they were pieces of a puzzle, respecting each one's dynastic rank. The subjects seem conscious of being painted; they pose speechless and motionless before a smooth wall, as if in a frieze, its axis Queen Maria Luisa. 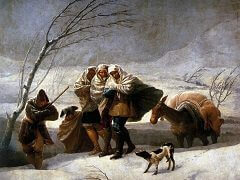 Yet Goya forces his frieze to curve, placing King Charles IV and his successor, the prince of Asturias, in front of the others and filling in the outer corners with the other relatives. 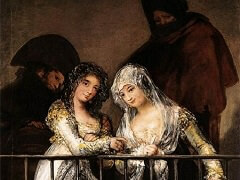 In the painting two others wear this gown: the Infanta Maria Isabel, in her mother's protective embrace, and the unknown woman on the left who averts her face. 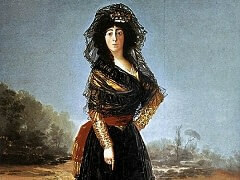 This mysterious personage was earlier thought to be the future Fernando VII's fiancee, but Salas has shown that in the year 1800 the prince's marriage was not yet planned. 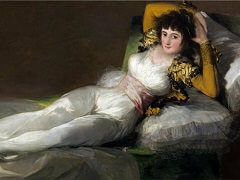 She may be Carlota Joaquina, the firstborn daughter, queen of Portugal, who was not present when the portrait was painted. The Infanta Maria Luisa Josefina, accompanied by her husband, Luis de Borbon, is also stylishly dressed, but with less elaborate finery. All the female relatives wear the queen's sash and ornaments perhaps created by the court jeweler, Leonard Chopinot. Arrow-shaped hairpins decorate almost all their coiffures, even that of the woman seen in profile in front of Antonio Pas-cual, the king's brother, who is possibly his wife. Thanks to the recent restoration, we can more clearly appreciate the tonal qualities that establish the role of each person within the family hierarchy, singling out the figure of the king, whose head is placed against a light background, and the heads of the queen and the heir apparent, set against a darker one. 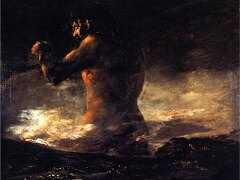 Goya adjusts his technique to the demands of the painting's enormous size. He applies color with sweeping brushstrokes and repeated splashes, which suggests that the work was to be displayed in one of the great halls of the palace. From a distance the flourishes of color and the abstract shapes converge into the various textures: tulles and silks, shimmering ribbons, sashes, and gems. The painter displays extraordinary skill in depicting skin tones, in the hair and its dressing, which range in hue from the yellow of Antonio Pascual's hairpiece to the powdered gray hair of the prince of Austria to the king's impeccable white wig. 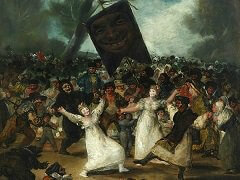 Goya is generally thought to have intended this painting as a critique of the royal family. The queen stands at the center not because she was rumored to be the real power behind matters of state, but because this would be her place in any European family portrait: women occupied the center, flanked by husband and children. 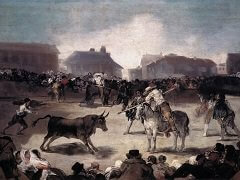 Goya employed the same arrangement in other canvases. Nor is the somewhat paralyzed physiognomy of the sitters a veiled caricature. It is simply the result of the huge painting's not being drawn from life but rather assembled from studies. The final version, if anything, plays down excessively realistic details: comparing the early sketch of the elderly Infanta Maria Josefa with the final product, we see that Goya has tempered her vanity, concealing her face in the shadows of the background.